I should just say, these are not necessarily my most favourite physics facts, and neither are they four in order of physical favouritism — they are just four of my favourite facts in no particular order. Let’s first consider just how empty that is. Suppose you are the centre of an up-scaled atom — the nucleus — and suppose your socks are the electrons that orbit the nucleus. Electrons orbit at a very far distance away, which is what gives atoms their emptiness. In this model, your socks would have to be orbiting your head at a distance of 50 kilometres away. This means there is just a lot of empty space between the middle of the atom and the outer “shells”, which of course means that anything made up of atoms (which is everything) is also very, very empty. To give an example: if you removed all the empty space from all of the atoms that made up the planet — and all the people, and all the cars and so on — you could fit the Earth, and everything on it, inside a single apple. So Why Don’t We Fall Through the Floor? The above probably produces rather a problem along the lines of: If Atoms are 99.99999-whatever percent empty, then surely we’d expect to fall through the floor? This is where it gets even more fun. You see, the outer “shells” are made up of electrons, and electrons have a negative charge. This means that when two atoms float near each other, their shells repel each other away, and so all matter (which is made up of atoms) floats on what is called an electrostatic field. Essentially, as you sit (or stand) there now, you are levitating on your chair (or floor). When you stand on the floor, you are not really touching the floor, you are levitating ever so slightly above it, and that is why you don’t fall through the floor. To explain this, we need to know Einstein’s basic principle of “nothing can travel faster than the speed of light.” Now, there is actually a theoretical particle called a Tachyon, which does travel faster than the SOL, but this is because it begins at a speed already beyond it, so — although this is rather irrelevant here — it is the breaking of the light barrier which is impossible and why, in that sense, we can’t go breaking into the SOL. Anyway. If you travel around in a circle very fast you can approach the SOL, but of course you cannot exceed it. 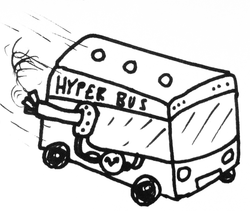 Imagine that Bussyese, the great Bus God, has given us a hyper speed bus that goes at 99.99% of the speed of light. Ignoring the technicalities of how it would be hurtling around the world’s surface, just imagine the fact that it is and therefore that it is going round and around in a big circle. At this speed, it is physically impossible to go any faster. We cannot break the Light Barrier — but, what if someone on the bus sneezes? Their violently fast sneeze adds to the forward velocity of the bus, which of course puts us at risk of going at a speed greater than the SOL. However, as stated by psychical law, we cannot break the Light Barrier. So instead, physics must slow down the inside of the bus to prevent anything on the inside adding to the forward velocity. (The bus itself is not slowed because this is a single, physical unit that is not “inside” something — I realise this is confusing, but never mind it for now.) So anyway, because physics has slowed down the inside of the bus, that means the things on the outside of the bus (ie: the planet it is hurtling around) will be moving “faster” — of course they are actually just moving at “normal” speed, but due to time being relative, the people in the bus feel they are moving at “normal” speed and the outside world is going much faster. This of course means the people inside the bus are going forward in time, because they are “slower” than the outside “normal” world. To put this into a little more perspective, if the people inside the bus spend an entire day travelling at 99% of the SOL, this equates to an entire year passing on the outside of the bus. Pineapples, or paperclips, or sofas or cats, or anything form of matter — it would still be just as hot. The sun is hot, not because it is “made” of hot stuff, but because it is very, very heavy. It weighs about a billion, billion, billion tonnes, and this huge mass puts the core under immense pressure which in turn leads to the high temperatures. 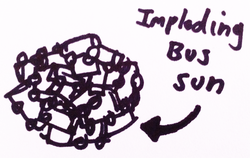 So if you dump a billion, billion, billion tonnes of anything into space it would creature just as much pressure and be just as high in temperature. The only problem is that our Sun is made up of hydrogen and that is what keeps the fusion reaction going — our supposed pineapple sun would cool down quickly, instead of burning for billions of years. And that concludes the kinds of things I like to think about. I hope you’ve enjoyed reading it, and I thank Adam for letting me write this for his blog.